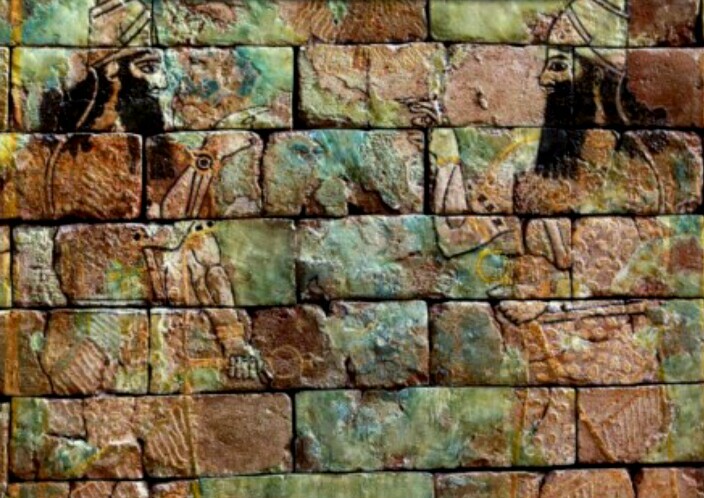 Not many of the Assyrian painting examples had survive, although by the clay tablets is known about magnificent decorations in the walls with vibrant colors, showing them battles scenes paintings and those regarding the Assyrian people daily life events and the court. 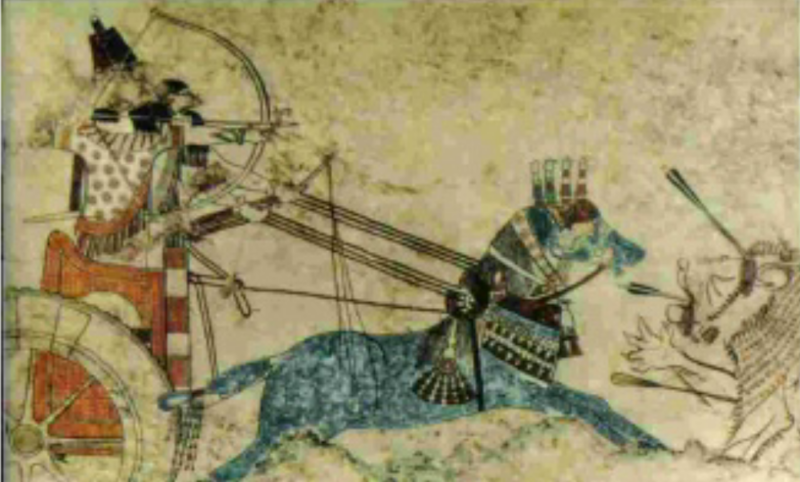 Among the examples that still survive are the paintings of the Til-Barsib palace, in an old Assyria region. They give us an idea about how those paintings serve as propaganda of the king power, the aristocracy and the gods. 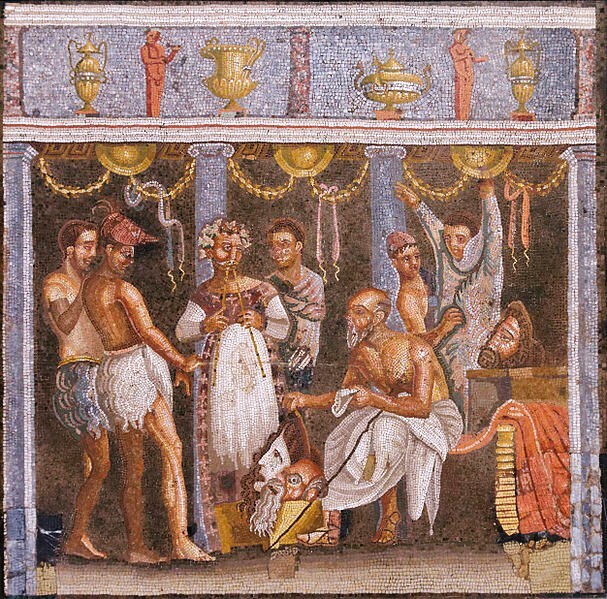 Mix in then are geometrical and figurative elements an must of the walls space was painted. 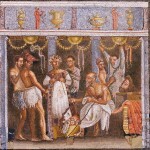 Palaces surfaces previously treated with stucco show scenes painted with several characters, as well as isolated ones, sometime accompany those, with another figure, looking exactly the same but oppose, like in a mirror. Those were mostly protection figures which appearance was not entirely human. Some show giants winged soldiers with peculiar face and animal head in a vigilant posture. Many of the bigger size protectors figures were located in the walls near the entrance of halls and doors and are related to the representation of minor gods. Some of the smaller size sculptures had paint on them but in certain places, like hightlighting elements, an were decorated with good taste and certain care for the details and finish. Vibrant colors were used in sculptures, relief and paintings, mostly blue, black and red, although combined some time with earth like color tones as the artist considered necessary in order to stand out then again the background. Related to the chromatic scheme of the Assyrian painting there is still a lot that need to be study, what is know so far is through the remained lefstovers pigments over the surfaces of some sculptures, in not the best preserved state as we would like, some of which had been detected thanks to new modern techniques because they hardly can be seen with the naked eyes. 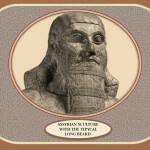 Is important to recap, as was mentioned in other post about the Assyrian culture, that they make good use of the technique they learn from Babylonia to decorate the exterior walls with the glassy tile bricks, giving them an spectacular resplendent and durable looks. 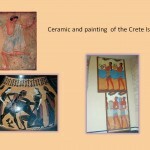 They manages to create a unique method, which they could produce those ceramic glass brick in great scale, but unfortunate this technique have been lost. They get the pigments from natural elements like seeds, plants juices, some metal dust, like gold and silver occasionally to highlight details. They use as well adhesives obtained from animals lark. 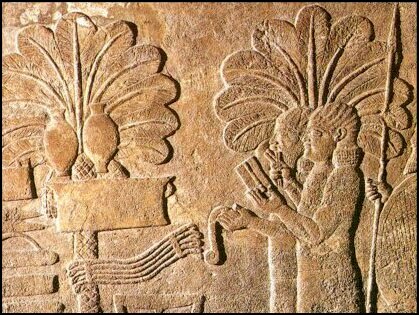 Their weapons were decorated with refinement, using vegetal, geometric and animals motives although human figures are found as well. Shield, spears, military cars on two wheels, presented relief and paint, and this decoration over weapons suggest they were important for protection an moral boost. 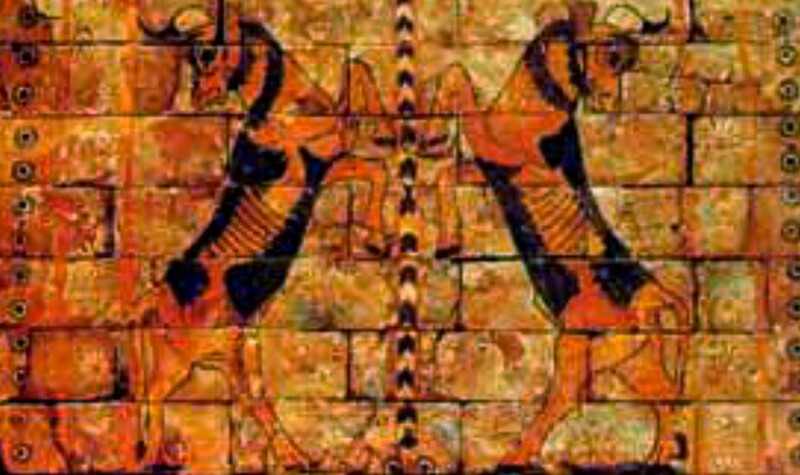 Assyrian glass brick painting showing mirror figures. Assyrian inherited from the Hittites civilization elements related to their style and thematics, and they were well applied, not only in painting, but with sculptures and relief as well. Their scenes representation show dynamic in the soldiers figures movement in battle, the pain reflected in the victims, (humans and animals alike), fierce expressions of the soldiers in battle. All in contrast with the serious expression and solemness representation of the king, priest and gods figures that were also portrayed in bigger size. Assyrian painting provide great importance to the representation of the “Tree of Life” thematic in painting and in relieves as well, for them it was directly linked and very attached to the origin of life by who they called gods. 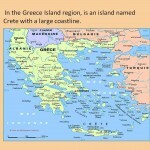 This thematic appear wide spread represented as well in all Mesopotamia, and also in other regions as for example: the Egyptian, Greek and Phoenician culture. 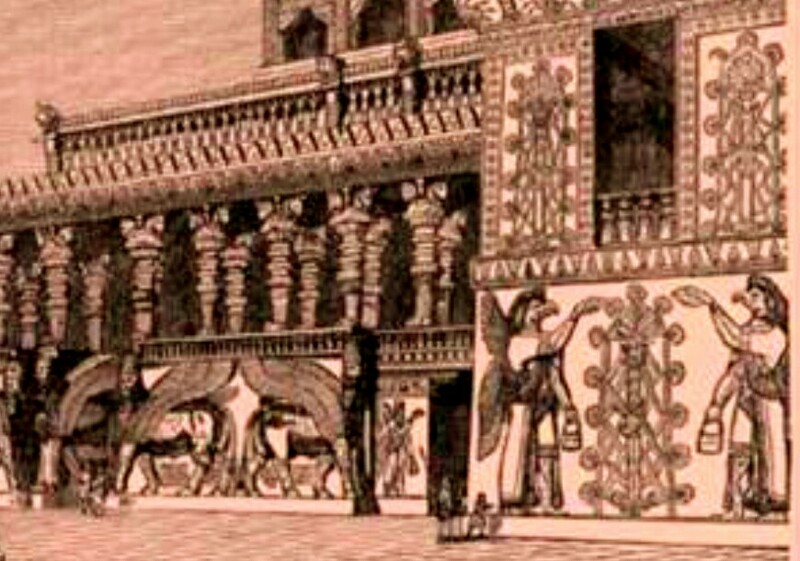 Artistic reproduction of Assyrian palace. 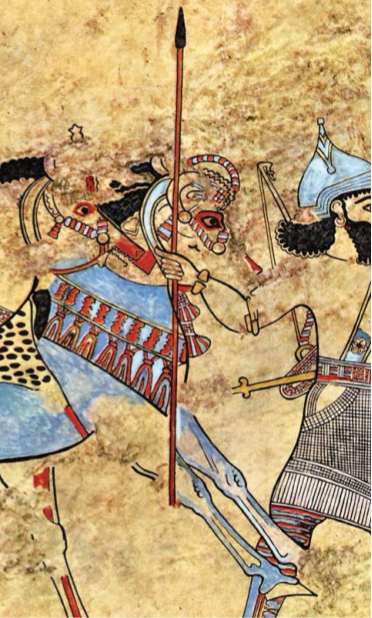 Figures in Assyrian painting are always represented with the body to the side as well as the head, although in some cases can be found the head slightly to the back like when the soldiers or animal are falling or been knocked down. Lines in Assyrian painting define carefully the contour of the figures, having a black line framing them and a black shadow as well that re enforce the illusion of three dimensional (3-D). 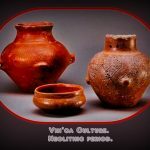 Their representation of vegetation in painting and relieves, showing a variety of plants of the region at that time, help us to understand about the indigenous vegetation and the use they have for them. They provide quite close details from the originals plants that they can be easy identify for us today. Assyrians represent in their paintings and relieves the daily life, the here and now, not as for example the Egyptians does, who concentrate in the beyond the grave themes and the resurrection of souls. 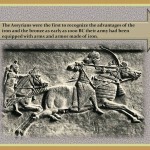 The Assyrian themes were current, they are chronicles of real life events. For us today those paintings and relief have enormous value, because they are this culture statement, their historical legacy, their testimony of a peril existence in a hostile environment. – Thematics serve to the propaganda of kings and gods power. – Representation of current topics, daily life events of people and kings. They are chronicles of simple life events as well as important religious celebrations. 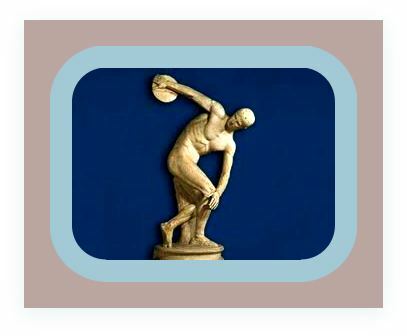 – Placement in walls of figures with mirror like effect. Some are face to each other, some are oppose. – Painting cover all the surface of the walls that have been previous treated with stucco. 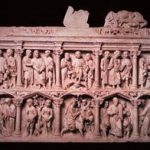 – Vibrant color were used in sculptures, relief and paintings, mostly blue, black and red, although combined some time with earth like color tones. -Assyrian painting define carefully the contour of the figures, having a black line framing them and a black shadow as well that re enforce the illusion of three dimensional (3-D). 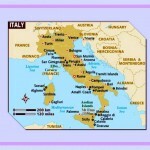 -Detail representation of vegetation of the region. 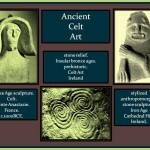 -Use of geometric designs as well as plants, animals and human figure in weapons, mostly for protection and moral boost. -Frequent use of “The Tree of Life” thematic. 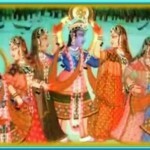 -The king, priest and gods figures were portrayed in bigger size, either stand or seated. 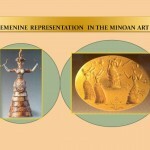 – Dynamic representation and fierce expression of the soldiers movement in battle, the pain in the victims, (humans and animals alike), inherited fron the Hittites style. – Use of the glass brick techniques assimilated from Babylonia to decorate the walls as a form of painting. Assyrian Glass brick painting. Museum of Babdad.